Not only can this make the floors unclean but wet floors also increase the risk of slip accidents, one of the main causes of injuries in the workplace. 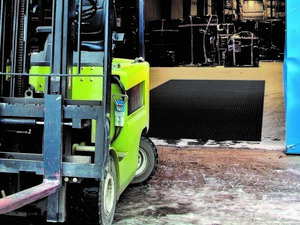 Specially designed entrance mats can be fitted near the warehouse entrance to scrape dirt and absorb water from the wheels of forklift trucks in the same way that regular entrance mats work. The difference is that the new Forklift Truck Mats available from First Mats are said to be substantially more durable, thanks to a 100% SBR Rubber backing and reinforced bi-level surface pattern. The mats have been weight tested up to 6,300kg ensuring a long life span, even in busy warehouse entrances. They also pass Flammability Standard DOC-FF-1-70 and are certified as slip resistant by the National Floor Safety Institute. The mats include the same features that make a regular entrance mat work so effectively. An absorbent material on the surface to soak up water before it enters the building, combined with a raised pattern of nubs which help to scrape dirt and stones off wheels and contain them within the mat area. 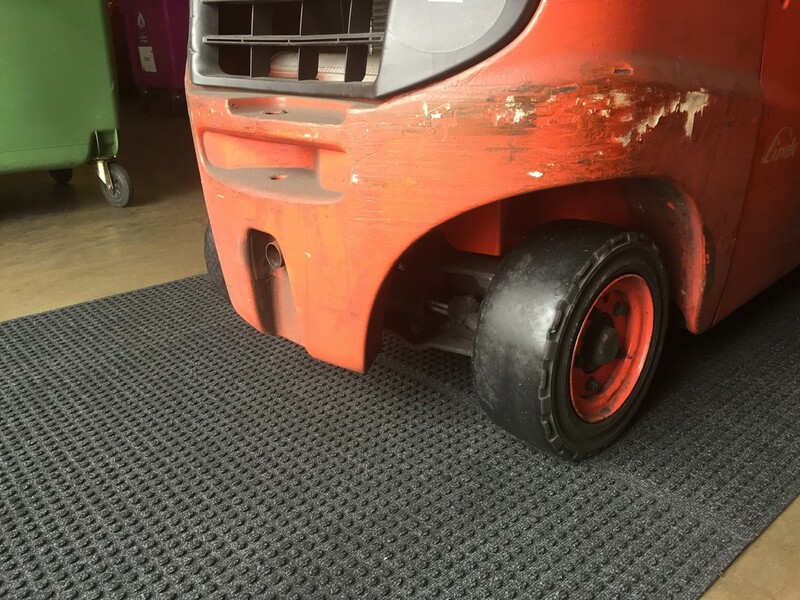 One of the biggest advantages of these Forklift Truck Mats, compared with existing alternatives, is that they can be fitted direct to the floor with adhesive tape so there is no need to close the entrance for a long period of time to fit a recessed mat system. In fact, each mat tile can be fitted in around 10 minutes. They are available in a modular tiled system, making them suitable for entrances of all shapes and sizes. If a tile is damaged, it can be replaced individually reducing potential maintenance costs.